The Faro ceramic cider pitcher is a glazed piece about 12 centimetres in diameter and 20 centimetres high. Measurements are approximate and may vary slightly between one piece and another, due to their traditional artisan production. The piece is covered by a glaze, which is a mixture of minerals that are melted, ground and then diluted in water. The resulting mixture is applied to the pottery and provides a waterproof layer and a special glow. Traditionally cider was served on pilgrimages and holiday celebrations in Asturias, where it was transported and sold in wooden barrels. Although wooden pitchers were used to serve it. 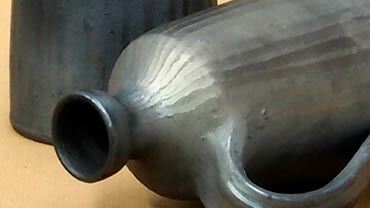 Later, with increasing pottery production during the eighteenth century, earthenware pitchers were used to serve the cider. They were manufactured for both domestic use and for use in cider houses. Up until the nineteenth century, when the glassworks started up in Asturias, the custom of drinking cider in earthenware pitchers remained, although from then on it was bottled in glass bottles, which are still used today.